Harvard’s endowment posted an 8.1 percent return on its investments for the fiscal year. It’s an improvement on last year’s returns, which saw the University in the red, but Harvard continues to lag behind its peers. Here’s what that means, and why it matters. This is an updated version of a story from last year. Harvard’s endowment is the $37.1 billion sum of money the University invests in a variety of financial markets. It’s the largest university endowment in the world. 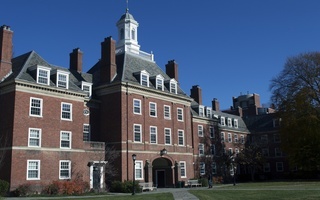 Harvard uses the endowment to fund a number of operating costs and programs and to ensure the University will have that source of funding for the foreseeable future. It’s not a giant bank account that can be spent however Harvard pleases: it’s actually around 13,000 individual funds—the majority of which are restricted in some way—that are invested collectively in a variety of assets. Harvard takes a percentage of the money from these thousands of invested funds and uses it to fund University programs. That percentage is usually around 5 percent, though Harvard and other big universities have been growing increasingly dependent on their endowments, drawing more money each year. It’s Harvard Management Company’s job to oversee these funds and grow the endowment— essentially, to put more money in Harvard’s pocket through annual investment returns. Any first semester Economics concentrator can tell you about the beauty of financial growth; as Harvard’s endowment grows larger, the 5 percent that it gives to University operations each year becomes an increasingly larger sum. As the endowment grows, so does Harvard’s capacity to fund research, financial aid, House renewal, and the like. What does all that money fund? About a third of Harvard’s annual operating budget comes from the endowment; last year, it contributed around $1.7 billion to Harvard, or over a third of the University’s entire operating budget. That spending supports all the vital functions of the University, from professorships to the library collection to financial aid. Harvard’s 12 schools are funded by the endowment to different extents: The Faculty of Arts and Sciences, for example, receives about 50 percent of its funding from the endowment, while the School of Public Health—many of its expenses provided for by a $350 million gift from 2014—takes only about 15 percent of its budget from the endowment. Can endowment from the money be used for anything? Because the endowment is heavily supported by donors, per Massachusetts law, Harvard has to follow the rules and conditions that those donors place on their gifts. And many of those gifts have strings attached; in 2015, 84 percent of the endowment—about $31 billion—had restrictions on how it could be used. That still leaves 16 percent of a multi-billion dollar endowment unrestricted, but oftentimes, donors specify the school they want their gifts to fund. Discretionary funds do exist, though, allowing University President Drew G. Faust to fund projects like [BLANK] Party and the Theater, Dance, and Media concentration. Where does all of the endowment’s money come from? In short? Donations. The University has raised more than $8 billion in its record-shattering capital campaign so far, and still has a year to go. Of course, the returns on these donations can soon begin to overshadow the donations themselves, so the endowment is a mix of recent gifts and decades-old money earned by investing donations. 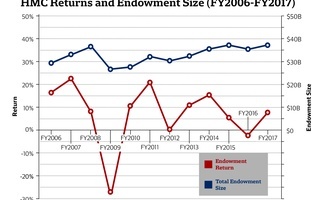 Why does the endowment’s performance matter? While $37.1 billion may seem like a lot of money—and it is—endowment losses can still make an impact on the day-to-day operations of the University. After the world economy crumbled in 2008, Harvard’s endowment plunged by $11 billion, losing more than a quarter of its value. As a result, the University was forced to make sharp cuts to its budgets, laying off hundreds of employees and paring down student services. Hot breakfast still hasn’t returned to the Houses. When the endowment posted negative 2 percent returns in fiscal year 2016—its lowest returns since the nadir of the financial crisis—a University report warned that budgets could be “constrained” for years to come. At the Graduate School of Arts and Sciences, that has started to manifest. The school announced in the spring it would cut graduate student admissions by 4.4 percent in an effort to manage costs. Then, professors and graduate students learned they would receive a salary increase that is outpaced by the rate of inflation. Complicating matters is a threat originating not from the endowment, but from Washington D.C. Faust and other university administrators are worried about the threat of deep cuts to federal research funding, which would hinder the academic mission of Harvard’s schools. 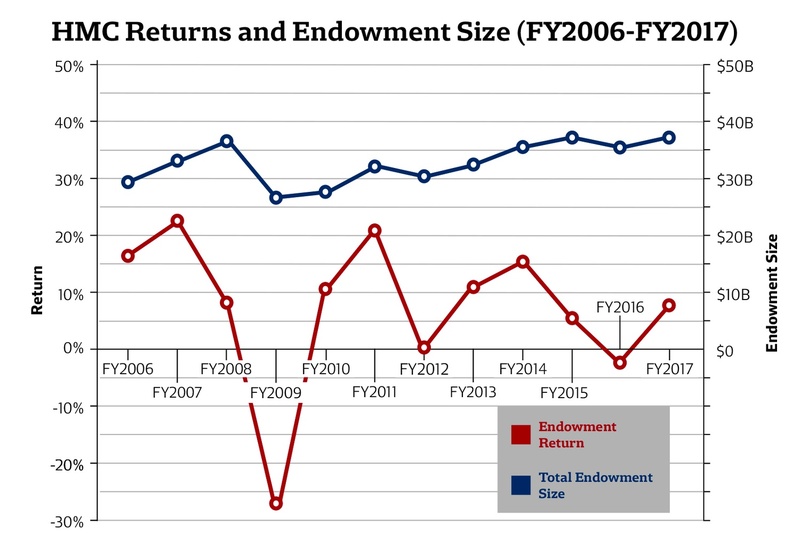 Is the endowment performing better now? That depends on the metric you're using. Some would argue that HMC’s investment returns for fiscal year 2017, 8.1 percent, are a marked improvement on how the firm has performed in recent years. It’s much better than the negative 2 percent Harvard returned in fiscal year 2016. If you’re relying on a strictly comparative lens — which the firm’s CEO and some experts have cautioned against — Harvard is not stacking up well against its competitors. 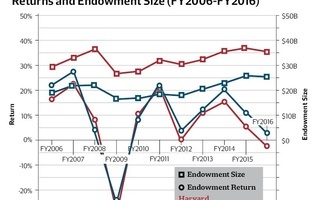 Once the envy of the finance world, the University is again behind its peers; of approximately 20 large endowments that have reported their returns this year, Harvard has the worst. Most posted double-digit returns for the fiscal year, attributing a boom in public markets to their success. For example, Dartmouth College reported 14.6 percent in returns. And MIT, Harvard’s neighbor down Mass. Ave, posted 14.3 percent. Everyone is waiting to see what returns Yale — Harvard’s eternal competitor and one of the best-performing endowments in the last decade — posted for fiscal year 2017. Stay tuned. ‘Deep structural problems’ sound serious. What are they? 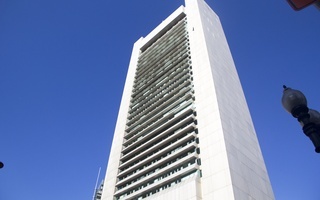 The review went on to talk about a“performance paradox” at HMC, where the firm’s employees manage to hit their internal benchmarks while the firm overall struggled. McKinsey said that’s partly because the firm has a history of setting low internal benchmarks for its returns. When those benchmarks are hit, regardless of whether the returns are objectively positive, employees receive bonuses. 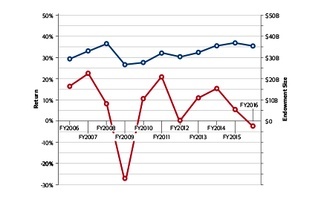 HMC’s investment practices have also fallen under increased scrutiny. Until January, HMC used a “hybrid” investment model, employing in-house and external money managers. The cost of that was steep, because Harvard had to pay its finance executives competitively with leading hedge funds, and those salaries add up quickly. Plus, there’s been a lot of internal turnover at HMC. N.P. Narvekar is the firm’s fourth CEO in a decade, and every new chief executive brings their own ideas to the job. That kind of strategic whiplash can be dangerous when endowment investment rely on a consistent, steady hand, some experts say. What is Narvekar doing to right the ship? HMC’s new CEO has made more than a few changes to the firm since he took over in December. There are larger, structural changes, like moving the firm away from something called a “silo” investment model, where its managers focus on the performance of individual asset classes like natural resources or private equity. It’s a model that Narvekar has argued stymies the growth of the entire endowment by preventing open dialogue between the firm’s many managers. HMC is also moving towards an external management system, where the majority of its assets are invested by out-of-house managers. In the process, the firm has laid off half of its internal staff, cutting its payroll down to a little more than 100. That means it’s paying less for in-house staff. But there’s a catch: using external managers is expensive, and may even end up costing the firm more money than if it had kept its managers in house, experts warn. So he’s instead striking out towards a “generalist” model, which will task all of the firm’s employees with thinking about how to improve the overall value of the endowment. And he’s putting his money where his mouth is. For fiscal year 2018, compensation at the firm is going to be tied to the performance of the overall endowment in order to align the interests of the firm’s employees with the goal of improving the endowment.